I USED Eurolines from London to Paris but we were dropped far from the city centre and, although Paris Gallieni terminal has a metro station, it was late and it would have been better with a shuttle bus to the centre. If that’s not possible, you should do something to help older people with luggage reach the metro. The service was good up to Paris but then there was no one to help and, for anyone who had not used the terminal before, a lack of information on what to do or where to go. C.C. Our priorities are to reduce delays for buses reaching the terminal at Paris Gallieni near Porte de Bagnolet and to make it easier for travellers to continue their journeys. The heavy Paris traffic and the very large number of services which use the terminal – it is Eurolines’ number one international destination – makes this very difficult. Paris Gallieni does have good metro and bus links and Porte de Bagnolet is a junction on the périphérique linking to the A3 autoroute, but the arrival, departure and ongoing transport areas are not all on the same level – and we plan to improve things. In autumn a redesign will put the booking office on the same level as London departures and also install new lifts as well as more escalators to improve access. WHY do the coaches not use the Channel Tunnel? It would be faster and, if you changed, I would switch to Eurolines. C.B. Actually, some of our coaches do use the tunnel and it cuts one hour off the journey. To use it, choose departures from London at 8.00, 10.00, 11.00, 14.00 (Friday only), and 22.30. If you want information, contact us on 08 92 89 90 91 (€0.34/min) or from outside France on 0033 1 41 86 24 21. Lines open 8.00 to 21.00 most days and 10.00 to 17.00 on Sundays. I TRIED to book from London to Paris on your website but failed. I also saw you serve Reims but I could not find a price. Is there a problem on your site? T.W. I’m sorry you could not get the information you wanted. 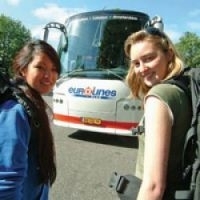 To book travel from the UK you should do so on the site www.eurolines.co.uk and for travel from France use www.eurolines.fr. There are several daily departures from London to Paris with the single fare of €35. However, regarding your trip from London to Reims, that is not possible at the moment. Last year Eurolines became the first coach operator to get permission to offer long-distance scheduled services in France and that will allow us to open new direct international links – but it takes time as each service must be approved by the transport ministry. We also have more than 170 services between French destinations – although not Paris-Reims. WILL Eurolines start a service between the UK and the southwest of France where there are many Britons and many visitors through the year? R.S. We have services all year from London to Toulouse, Agen, Bordeaux, Saintes, Niort and Poitiers. This month, from July 1, we have services to Montauban, Cahors, Souillac, Brive la Gaillarde, Limoges and Bellac. DO YOU have a service between the UK and Alsace – and can you tell me the approximate fares? The simplest way is to go via Brussels and then to Strasbourg. Travelling from London Victoria, on Wednesdays and Fridays, it leaves at 14.00, arriving in Brussels at 22.30; then the 23.00 to Strasbourg, arriving 4.40. From Strasbourg, the service is on Thursdays and Sundays, leaving at 23.30 to arrive in Brussels at 5.55 and then leaving Brussels on Friday and Monday at 7.00 to reach London at 12.45. Approximate fares – for travellers under 26 years – would be €70 single and €139 return. It is also possible to travel via Paris from London Victoria. London-Paris services leave every day with links to Strasbourg each day, bar Tuesdays and Thursdays, at 22.00. They arrive next morning at 5.00. You can only book this leg on www.eurolines.fr and fares start at €28 single. I OFTEN travel between the UK and Menton in Alpes-Maritimes; can I take my dog on the coach? H.S. A TRIP between London and Avranches, Normandy, is listed on your site but I was told it was not possible. M.B. Our present services do not have a coach to Avranches – but we do have a service to Rennes. It leaves Wednesdays and Fridays at 14.00 and arrives in Rennes at 10.15 the next morning. CAN I travel Niort or La Rochelle to Paris or Bordeaux? D.S. From Niort we have services each day except Monday and Saturday at 6.30 and arriving in Paris at 12.45. Single fare starts at €25. We do not have a service to Bordeaux, but can offer Bayonne with departures every day bar Friday at 18.30 and arriving at 23.59. Single fare starts at €23. From La Rochelle, we have services to Bayonne each Tuesday, Thursday and Saturday at 23.30, arriving the next day at 4.15. Fares start at €23. WHAT safety features do you have on Eurolines coaches and is it necessary to have the seatbelt fastened all through the trip. G.F.
Each year our coaches cover more than 100 million kilometres and carry more than three million passengers. Keeping travellers and staff safe is at the heart of our priorities. Smoking is banned and wearing your seatbelt is mandatory at all times. Our coaches are fitted out to high standards for safety and comfort with toilets, radio, TV and video, air suspension, ABS brakes, sound-proofing and double-glazed windows. WHERE can I find a list of your services? I’m particularly interested in travel between Toulouse and other parts of France. D.A. DO YOU have to change coach on long trips – and what do you do to avoid lost luggage? G.K. Depending on the destination, it may be necessary to change vehicles – but this is spelled out on your ticket. As for luggage, Eurolines gives you numbered stickers when you book so that you can label all your baggage. Our drivers will also help where possible with loading and unloading.